There were 26 press releases posted in the last 24 hours and 153,150 in the last 365 days. Intrepid Networks’ situational awareness application, Response, answers the call for supporting the critical operational needs of public safety agencies. 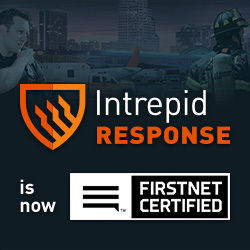 ORLANDO , FLORIDA , UNITED STATES , July 11, 2018 /EINPresswire.com/ -- ORLANDO, Fla., June 11, 2018 – Intrepid Networks, the industry leader in public safety mobile situational awareness and communication applications, today announced its acclaimed Response mobile app is now FirstNet Certified and available in the FirstNet App Catalog for FirstNet users across the United States. First responders risk their lives and health for the communities they serve. When they need to understand the scene quickly, a situational awareness system is necessary to provide real-time geospatial data, emergency notifications and rapid multimedia sharing for resource management, team collaboration, and incident management. Response is a mission-critical solution that’s secure and reliable for first responders that can quickly integrate their communications with internal personnel as well as outside agencies. Intrepid Response application is a simple to use situational awareness solution that provides real-time location data on a feature-rich map and rapid media sharing amongst team members all in one tool. Response is invaluable for any dynamic operation when all the field and supervisory users must be aligned on a single electronic common operating picture. Intrepid Response is available on both web browser and native mobile smart device clients. The FirstNet Certified designation is limited to app providers who meet relevancy, security and data privacy requirements and demonstrate their commitment to meeting additional acceptance criteria related to higher (99.99%) availability, app resiliency and scalability. The designation communicates the app’s ability to support operationally critical needs and can be used to help public safety agencies make informed decisions about which apps to select and recommend. Certified apps are included in the FirstNet App Catalog which is available to FirstNet users. FirstNet is the nationwide broadband platform dedicated to public safety. It is a dedicated LTE communications ecosystem complete with devices and apps to help first responders in every state and territory with their lifesaving mission. Being built with AT&T in public-private partnership with the First Responder Network Authority, FirstNet is enabling a much-needed technology upgrade to first responders’ communications capabilities. FirstNet will help law enforcement, firefighters, emergency medical service crews and other emergency responders stay connected to the information they need to help keep themselves and their communities safe and secure. It gives first responders the tools and reliability they need to communicate and share information every day and in every emergency, – regardless of crowd size or network traffic. To learn more about FirstNet, go to FirstNet.com. Company: Intrepid Networks’ mission is to provide critical operational support to both government and commercial organizations so that team members can instantaneously communicate, collaborate, and coordinate their operations utilizing low-cost, easy-to-use and simple to deploy web and mobile applications. The Intrepid Suite empowers your organization to eliminate mistakes and enhance processes to perform at the highest operational potential.